It's the two year anniversary of the Sandy Hook (supposed) elementary school shooting, but you wouldn't know it from looking at the mainstream media lineup of stories this weekend. I searched hard and found very few if any stories about Sandy Hook being covered by mainstream media news. Isn't this amazing considering the magnitude and the context of this shooting? Isn't it odd considering that it specifically involved mostly children (according to the media and Connecticut police)? Given that supposed shooter, Adam Lanza supposedly gunned down 20 children in cold blood, shouldn't this be a day that lives vividly in our minds and hearts forever? Why is this not the case? Why does the Sandy Hook shooting not seem to follow any of the rules of nature? And why does it feel so odd when you take a close look at all the facts including the available videos, police reports and original news stories? If you believe the Sandy Hook High School shooting of December 14, 2012 then this past weekend (Sunday December 14, 2014) should have been a memorable and historic tragic day of mourning for you. That is because according to U.S. government official crime records the Sandy Hook shooting was the second deadliest shooting in U.S. history. That's right, the second all-time deadliest shooting in U.S. history where a total of 28 people were murdered in a bloody river massacre by Lanza before killing himself. Imagine, this is the second largest shooting massacre in U.S. history and the largest mass shooting of children in U.S. history and the mainstream media hardly (if at all) even mentioned this important and historic date in American history. Isn't that a bit odd? Doesn't this compromise and contradict basic human compassion and sense of history?? Think about this. In a country that has a history of reminiscing over historic events and dates, isn't it a bit odd that mainstream media would depart from its fundamental mission of news gathering and go out of their way to keep Sandy Hook out of the minds of the masses this year? By all means I believe this is by design. Sandy Hook follows the government-sponsored false flag script to perfection: Deny at any cost regardless of what is revealed to the general public, change and rewrite the laws to protect not solve the crime, resist investigation of any kind, ignore all the odd behaviors and physical evidence of fraud and just quietly follow the script or else. So much hinges on the Sandy Hook lie, the least of which includes: the integrity of the entire State, the lack of integrity and thus criminal activity of the Connecticut police department including head lying patsy Lt J Paul Vance, the integrity of the media mouthpieces, the potential multiple fraud criminal charges that would be faced by the fake (crisis actors) victim family members, even the federal government itself who would be very much a part of this cover-up and would risk being exposed. How about the creepy Coroner and his most bizarre interview with the media telling one lie after another? Are you getting the bigger picture? All conspiracy allegations aside, the fact of the matter is that it is quite a phenomenal oddity for the mainstream media to ignore the entire memory of this most deadly children massacre in U.S. history. Considering the magnitude of this shooting we should have expected Sandy Hook mania this entire weekend with story after story looking back at that incredible and tragic day. Instead there is no big moment of silence, no grief, nothing that feels like a real tragedy happened. Given what we know about information and how mainstream media operates, none of this makes any sense unless we conclude that this whole process of ignoring Sandy Hook is a continuation of the psyop false flag shooting and all of its already piling collection of oddities. The same pile of oddities we would expect from a typical government false flag shooting. So even if we were just asking questions without committing to an opinion about the Sandy Hook story, shouldn't we see this mass media ignoring of the Sandy Hook massacre as extremely odd and thus concerning if not downright disturbing? Consider that every year mainstream media finds time to remind audiences of other famous shootings, murders, and crime events when their anniversaries come. Whether its the Columbine shooting, the Virginia Tech shooting, Waco, Oklahoma City, or whether it's killers like Charles Manson making the news, the Son of Sam famous serial killer, JFK, or even 9/11, all these killings and events get their due proper attention and place in history at least once a year when their anniversaries arrive. So why did we see a mainstream media near blackout of Sandy Hook this year? Could it be that they have something to hide? Could it be that they don't want anyone reminded of this false flag? Unlike the resurrecting of the Bin Laden death hoax with another fake Navy Seal story, the Sandy Hook false flag would get no such resurrection even on its own anniversary. Could it be that Sandy Hook is a very fragile story right now and mentioning it will only bring attention to damaging stories, facts and oddities that the general public will not go for? Could it be that the controllers are nervous about Sandy Hook because of the fraud, deception and theft that will boomerang back to the crisis acting family members? Could it be that this is a desperate attempt to protect the safety of this overall story and thus the safety of all the players involved? Is the Sandy Hook false flag about to blow up? There is so much going on behind the scenes that we don't know and a lot that happened that day that we may never know. Is this the reason why 'We Need to Talk About Sandy Hook' - the recent Sandy Hook documentary has been the most censored film on the internet for over a week now? Will this exaggerated government and media effort of ignoring Sandy Hook this year and jumping out of character and out of narrative (given it's status as the second largest mass shooting ever in U.S. history), backfire? Can you tell a child NOT to grab cookies from the cookie jar and then leave the child alone all day and expect he will not cheat? Will this latest trick and their aggressive effort to push Sandy Hook from everyone's consciousness not only backfire but actually help to get the message out about Sandy Hook? Let's hope so. Sandy Hook shooting is too odd, too creepy, too bizarre to ignore. All of America must come together to demand answers, sift through the evidence and take action to prevent another staged shooting. Given the actions of corrupt media, governments and police, we can no longer trust them to tell us the truth about any event. We, America, the world and all of humanity cannot continue to be lied to by government controlled media. It's time for truth to come out. America and the American people also need a voice in every scenario including tragedies, shootings, and public emergency situations. The time has come to declare a need for media reform, government reform and legal system reform. Perhaps its time to abolish government all together. Either way, it seems proper for civilians to play a key role in keeping media honest. It's time to break the relationship between police and media. It's time to step in and find ways to block the next false flag scripted shooting from taking place by finding ways to fix media and monitor government. It's up to us, we can continue believing mainstream media and government lies about events like Sandy Hook, or we can listen to the independent researchers and investigative journalists who don't have an interest in the state. We also have the option of becoming our own investigators, thinking critically and gathering the evidence on our own. We can seek truth and act as journalists. Efforts like these have spawned truth about Sandy Hook that is perhaps too frightening to consider for some. Sandy Hook should remind us that the time is now to take charge of our own future and stop relying on lying government. Let the Sandy Hook story be a lesson to us all about how bad things have become when government and media can get together and make stories happen on the fly for the purposes of a specific agenda. Hopefully if the oddities of Sandy Hook don't convince you that Sandy Hook was staged then hopefully the subsequent behaviors like mainstream media not acknowledging the anniversary, will strike you so odd that it will compel you to do your own research. Remember, a story should be considered in its entirety not in fragments. Try to see how this bizarre ignoring of the Sandy Hook supposed mass shooting anniversary might be a big part of the greater story. Take action! 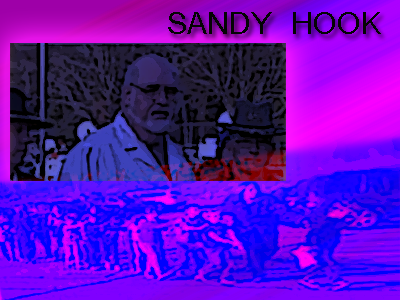 Visit SandHookJustice.com for additional information and research on the Sandy Hook false flag crime and to find out ways that you can be involved in bringing the true criminals to justice.